The UH West Oahu Career Closet is making its debut during the Career & Internship Fair today. The UH West Oʻahu Career Closet is having its big reveal today during the Career & Internship Fair, showcasing a sampling of the shirts, blouses, and other interview-appropriate clothing available to students through the new program. 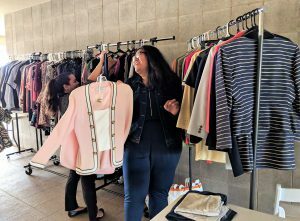 Organizers of Career Closet will showcase some of the clothing items they’ve collected for the endeavor designed to help students who don’t have outfits to wear to job and internship interviews. The idea for the program originated with Ryan Perreira, UH West Oʻahu Intramural Coordinator, during Aloha United Way meetings last year, with Michiko Joseph, UH West Oʻahu librarian, spearheading the effort to create Career Closet. College students are generally advised to wear professional attire when interviewing for a job or internship. That may mean dressing differently for different organizations – a law firm may require women wear a suit jacket or men wear dress shirts and ties, while a simple blouse and skirt or aloha shirt and pants may be acceptable somewhere else. It’s suggested students get an idea of how people dress at the business or organization to gauge what to wear to an interview. Both men’s and women’s apparel suitable for wearing to job interviews is available. 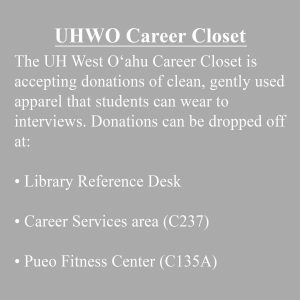 Under UH West Oʻahu’s Career Closet programs, students will be able to select up to two outfits to keep per semester depending on size availability. Career Closet organizers are asking for donations to build up the program’s offerings. 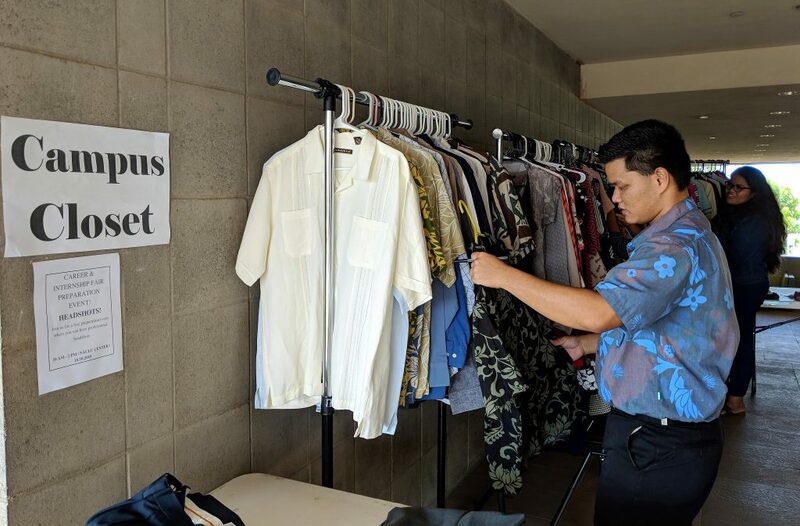 They are seeking clean, gently used clothing that can be used for professional events/activities, according to Loea Akiona of UH West Oʻahu Career Services, which is staging the Career & Internship Fair. The fair is scheduled for 10 a.m. to 2 p.m., Wednesday, Oct. 10 in Campus Center C208. Akiona said the group has tried to emphasize donations that may appeal to students also – modern pieces that students would consider wearing. He said the initiative is a work in progress but current plans call for the clothes will be made available through campus events and through appointments. Organizers (Joseph, Akiona, Career Development Specialist Lori Foo, Human Resources Specialist Janice Sunouchi, and Perreira) are continuing to collect clothing. Accessories are not being sought at this time because of storage limitations. Donations can be dropped off at the Reference Desk at the James & Abigail Campbell Library, the Career Services area in C237, and at the Pueo Fitness Center (C135A). Tagged Career & Internship Fair, Career Closet, Interview clothes, Janice Sunouchi, Loea Akiona, Lori Foo, Michiko Joseph, Ryan Perreira, The University of Hawaiʻi-West Oʻahu, www. Bookmark the permalink.